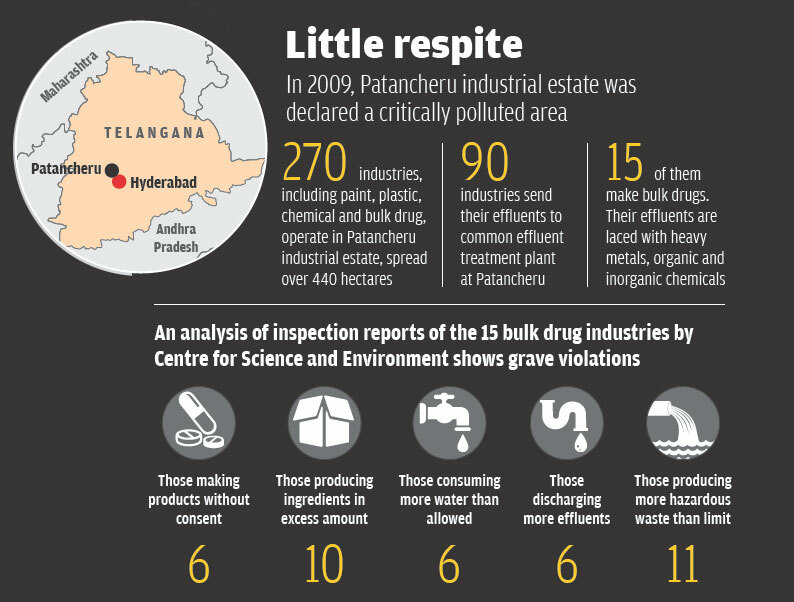 For more than a decade, 15 bulk drug manufacturers have been operating in Telangana’s Patancheru-Bollaram industrial area, the country’s pharmaceutical hub, with scant regard to environmental rules and Supreme Court orders, shows an analysis of the industries’ inspection reports. The Telangana State Pollution Control Board (TSPCB) released the inspection reports in response to a Right To Information (RTI) Act petition filed by K Chidhamberum, president of non-profit, Citizens for Better Patancheru Constituency. In 2013, Chidhamberum moved the National Green Tribunal (NGT) in Chennai against the erring industries. In his petition, Chidhamberum alleges that most industries continue to pollute the streams and villages adjacent to Patancheru-Bollaram area in the absence of an effective vigilance by the TSPCB. “I realised that the inspection reports of the TSPCB will help prove the violation by these industries as well as the lackadaisical attitude of TSPCB,” says Chidhamberum. He sent the inspection reports to Delhi non-profit Centre for Science and Environment (CSE) for analysis, which found that all the companies, barring two, were at fault on all the parameters that require the permission of the TSPCB. Most companies were producing ingredients for which they do not have permission. They were using more water than the permitted limit and dumping more effluents and hazardous waste than allowed. Worse, two units of Hetero Drugs Ltd have been operating without the environmental clearance from the Union Ministry of Environment, Forest and Climate Change (MoEFCC). In seven cases, the inspection report neither mentions details of the ingredients that are being manufactured without the consent of the TSPCB nor the volumes of effluents and hazardous wastes the plants discharge (see ‘Little respite’). CSE researchers say the discrepancies raise doubts about the quality of inspection carried out by TSPCB. MoEFCC classifies pharmaceutical industries as “red category” because of the hazardous waste they produce. However, till 1997 industries at Patancheru routinely dumped their waste in the surrounding land, irrigation fields and released their effluents into the Nakkavagu stream, that passes through the industrial estate, and other waterbodies that act as feeders for the Musi river, flowing 18 km from the Nakkavagu. Some would also send their wastewater in tankers to the common effluent treatment plant (CETP) at Patancheru, which is ill-equipped to treat pharmaceutical effluents. 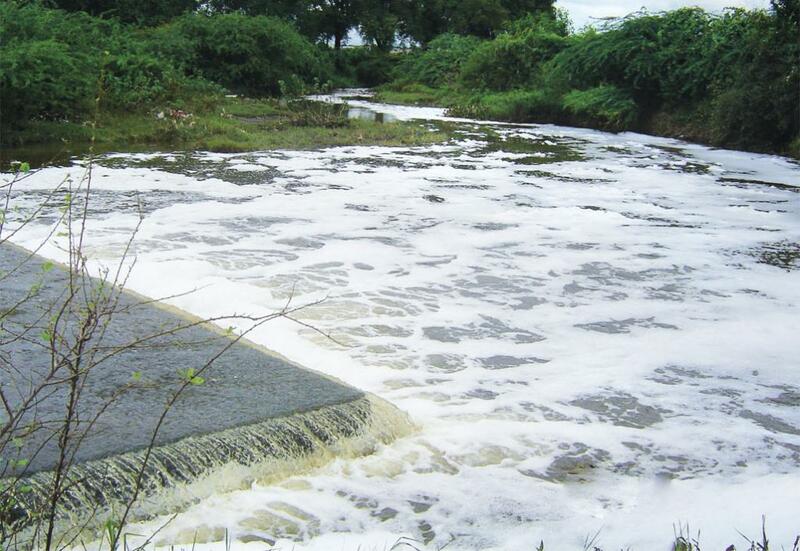 The CETP would then release the untreated effluents into the Nakkavagu stream, polluting it further. Following a public interest petition in 1997 about the highly toxic effluents from the industries, the Supreme Court banned the establishment or expansion of bulk drug manufacturing units in the estate. To improve the quality of surface and groundwater, it ordered the pollution control authorities to channelise effluents from the CETP to the mega sewage treatment plant (STP) at Amberpet through an 18-km pipeline so that industrial effluents can be diluted by mixing with sewage. It also asked the industries to ensure zero liquid discharge (ZLD), which means they would have to treat the wastewater and reuse it. Since these industries discharge effluents with different chemical compositions, to ensure zero liquid discharge, they need to employ various technologies. For treating effluents with high TDS (total dissolved solids), the industry has to install a multi-effect evaporator (MEF) and agitated thin film dryer (ATFD), whereas low-TDS effluents are treated at the biological treatment plant and reverse osmosis (RO) plants. The industries further recycle the RO permeates and send the rejects to MEF and ATFD for further treatment. But employing such technologies turns out to be expensive for plants that generate less volume of low-TDS effluents. This often prompts the industries to violate the zero-liquid discharge policy and clandestinely send their low-TDS effluents to CETP. In fact, the 18-km pipeline meant to shift wastewater from the Patancheru CETP to the Amberpet STP is just an eyewash, alleges Chidhamberum. Since the installation of the pipeline, the quality of the Nakkavaagu appears to have improved. While the exact improvement in their quality is yet to be ascertained by independent studies, Chidhamberum says the intensity of pollution has actually been transferred to the Musi river and 100 villages in its drainage basin. The problem is Amberpet STP, located next to the Musi, is also ill-equipped to treat the pharmaceutical effluents with different chemical compositions. As a result, it discharges the untreated effluents into the river. Diseases like cancer, infertility, hormonal imbalance and birth defects are common in the area. In fact, a family now spends 30 per cent of its earning on treatment, says G Vijay, assistant professor at the School of Economics, University of Hyderabad. To gauge the prevalence of pollution in the area, his students had interviewed families in the villages of Kazhipalli, Guddaputharam, Sultanpur and Kistareddypet on October 29. P Ishwar Reddy, executive director of the Bulk Drug Manufacturer’s Association (BDMA), told Down To Earth that all industries at Patancheru are complying with the Supreme Court orders and directions of expert committees. Though Reddy admits that excess discharge of water and hazardous waste result in pollution, he says any change in the pharmaceutical ingredient does not result in more pollution. But CSE researchers argue that any change in the pharmaceutical ingredient requires recombination of chemicals and different manufacturing process. This will invariably alter the chemical composition and toxicity of the effluent. The researchers add that the pollution control authorities should improve their monitoring measures and be extra vigilant to check the release of toxic effluents at the point of discharge.